First off, you can always expect a smiling face and a caring hand to help you at Miller Spinal Health & Wellness Center. We’re here to help, and we love seeing patients like you leave smiling ear to ear. We’d like to have full information and a detailed history of your health and problems to help you more effectively. So please download the paperwork and fill it in at your leisure. Then he’ll examine you to measure your health, identify the source of your pain and the cause of your problem. 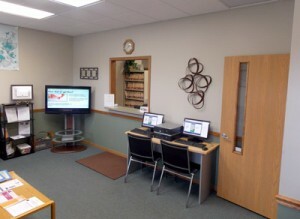 “We’re known for our detailed and thorough examinations which include a physical or orthopedic exam, and a 5-tech scan. This leads us to an overall health index number. If necessary we can do X-rays at this time. We can conduct the scan again after treatment and the change in the health index number measures the improvement in your condition. “We prefer to take the time to study our reports so I can present your options for care. This is why most often we don’t adjust on your first visit and instead schedule your next visit a day later.” However if you are in severe pain and require immediate relief please inform Dr. Miller and he will do whatever is possible to alleviate your pain. This visit may last up to one hour. The visit begins with a consultation with Dr. Miller. He’ll share results of exams and tests and explain the cause of your problem. He’ll tell you whether chiropractic care will be beneficial for you and share a treatment plan depending on your health goals. He’ll also share information about the time or duration of treatment and expected financial costs. You will have plenty of time to ask questions and understand your recommended course of treatment. Once you decide to proceed with treatment Dr. Miller will treat you in accordance with the plan, ensuring that you’re comfortable and we get your health on track. This visit may take half an hour or longer. Subsequent visits will be scheduled depending upon your specific needs. We’ll make sure we periodically review your milestones to make sure we’re on target.